“If I could go back to a time before now. Before I ever fell down. Go back to a time when I was just a girl. When I had the whole world gently wrapped around me” (‘A Lot’s Gonna Change’). 30-years-old Los Angeles-based art-folk musician Natalie Merring – who performs under the moniker Weyes Blood – grew up peaceful and content back in the little less daunting, more carefree decade of the 90’s. This was a time before global warming was scientifically revealed as a serious humanitarian threat likely to happen in the near-future. A time before the internet and all its social media platforms became a daily obsession for the average Joe and Josephine. It was also a decade that featured the release of the romantic tragedy blockbuster Titanic. 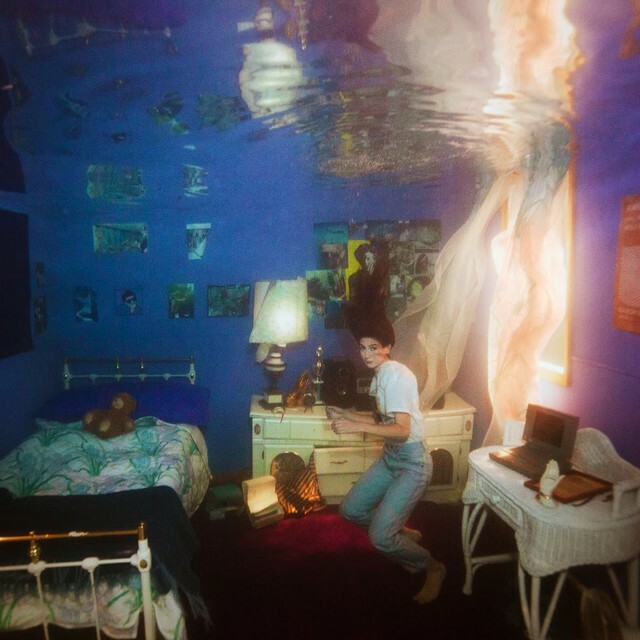 It’s a film that inspired Weyes Blood’s new record title Titanic Rising because Natalie Merring is convinced it was catered for little Caucasian girls of that era, containing a passionate affair that she now labels as one of many modern immortal myths. This is because at the age of 12, when Merring’s bubble-wrapped 90’s ended and all-changing 21st century begun, her happy and naive childhood suddenly burst out of proportion. The once happy child’s eyes opened up to the calculated fabrication of cinema and at the same time there was a rapid rise in cyber world influence, mobile technology advancement and natural disasters providing evidence that her comofortable environment was collapsing. Natalie Merring is not alone in her bamboozlement. She is the spokesperson for generation Y. Which in a way cleverly juxtaposes with her o nostalgic 70’s production style of folk and art rock. Titanic Rising‘s opener ‘A Lot’s Gonna Change’ accurately sums up this generation’s thoughts: “Born in a century lost to memories. Falling trees, get off your knees. No one can keep you down.” But like Leonardo De Caprio’s Jack says to Rose in the final chapter of Titanic: “promise me you will survive….that you will never give up…not matter what happens…no matter how hopeless”, Weyes Blood always tries to promote hope to listeners amongst the disillusionment. For all of the lyrical brilliance on ‘Movies’, it’s also one hell of music experience. A spacious and subterranean environment that begins hypnotic and ethereal with Natalie Merring’s haunting and echoed vocals on top of a looped effervescent synth, before sharp cuts of violin and knocking attempt to wake up the listener from their dreamy fantasy. It continues Weyes Blood’s regular blend of Enya and Karen Carpenter. Titanic Rising climaxes with a short interlude of violin-playing called ‘Nearer to Thee’. Its name is an ode to the last piece of music (‘Nearer. My God. To Thee’) that was supposedly played by the resolute violin performers on the Titanic before it sank. This is perhaps a metaphor for never giving up on hope, even during the sinking ship disaster that can be 21st century life.